With the kitchen now done I am gearing towards decorating my outdoor space. I have already gardened my front and side yard (very simply) but the back is where we spend most of the time anyway and I'd like to spend more time this year outdoors than we did in our previous home. So far the weather has been cool but that's no excuse when you can hang outside with a warm sweater and a pair of Uggs! Add some comfy seating with cushions and maybe even a throw or two! Here is your daily dose of inspiration and how you can get the look. I myself am going to have to be quite creative because between the kitchen renovation and new pool purchase (post coming shortly) I feel we've been spending a lot of money! 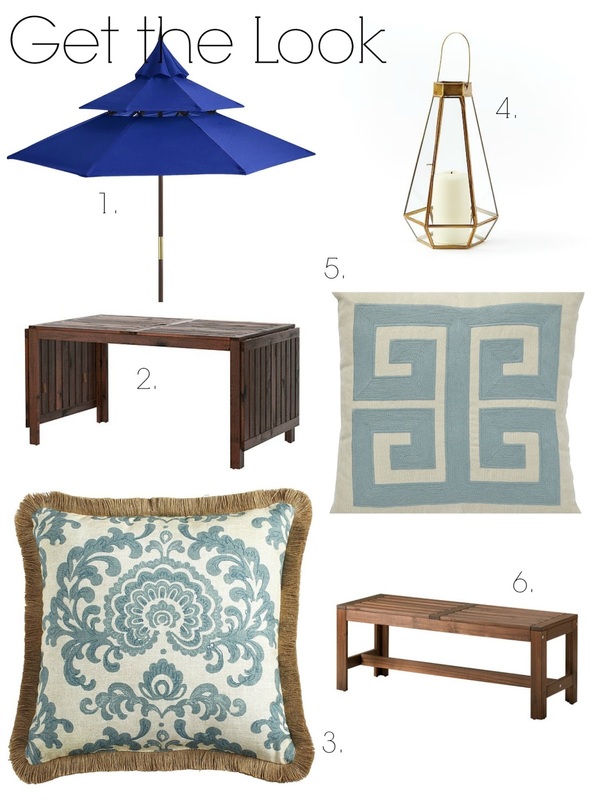 Here's how to work with what you've got (or maybe add just a few small purchases) to complete the look. 1>> You can never go wrong with a real wood table. 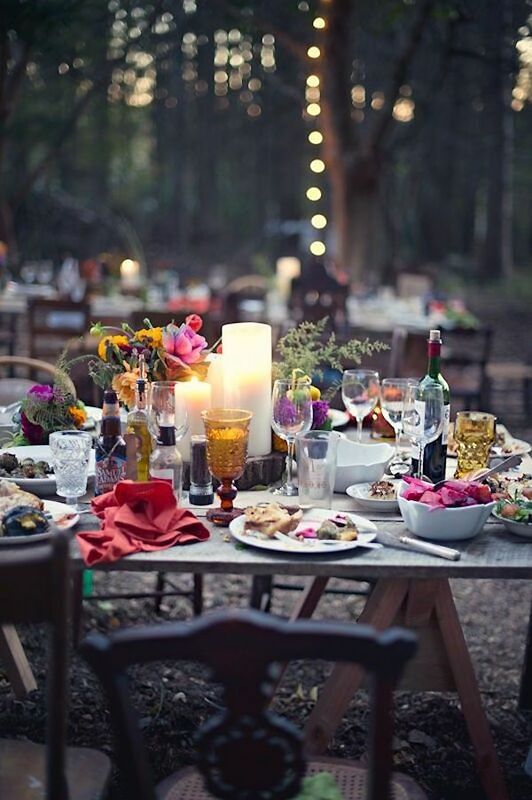 I know there's a little maintenance involved but even a worn table looks gorgeous when dressed properly! 2>> Layer, layer, layer. 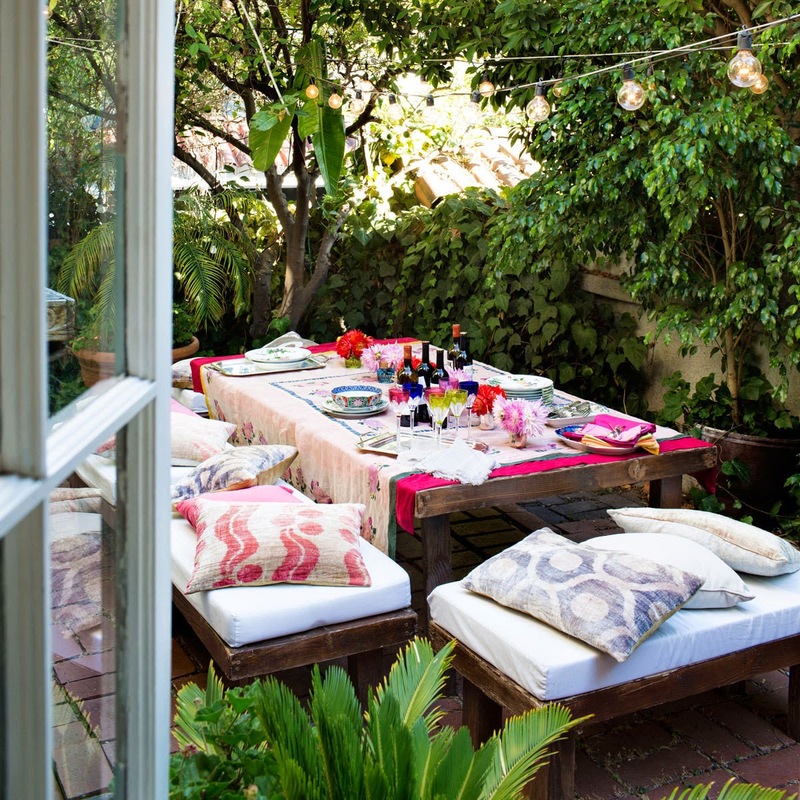 Pillows over cushions, and 2 table cloths overlapping create a cosy pulled together look. 3>> Lots of candles (in groupings of three). Obviously they have to be lanterns, hurricanes lanterns, or covered candle holders so the flames remain lit! 4>> Overhead lighting. A chandelier, string of lights, or even torches. You need to address lighting because chances are you will be outside at night! 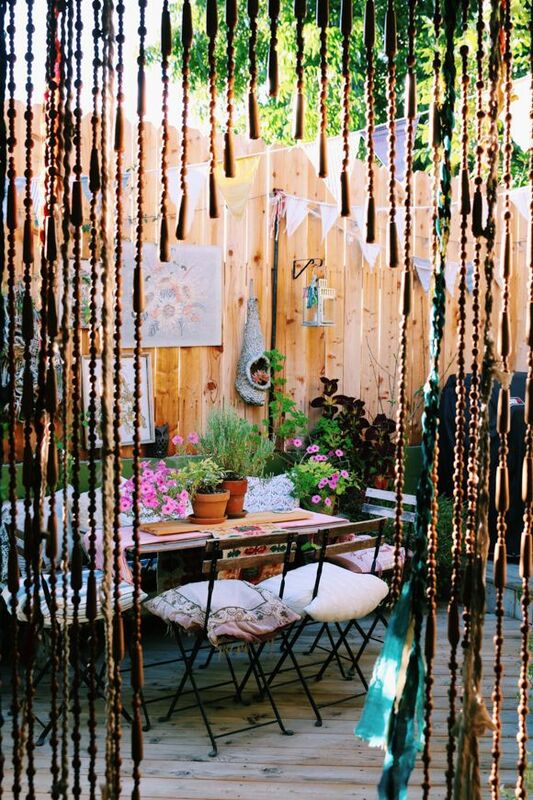 If you have an umbrella you can hang lighting from underneath it! It creates a cocoon like feel, it's very romantic! 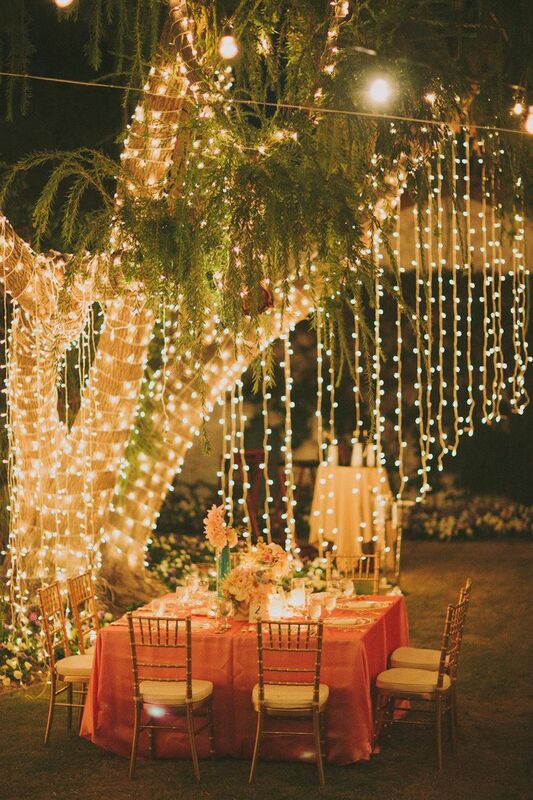 This (above) is perfect for a wedding, a little overkill otherwise but I really just wanted to show you how beautiful, bright and inviting an outdoor space can be! 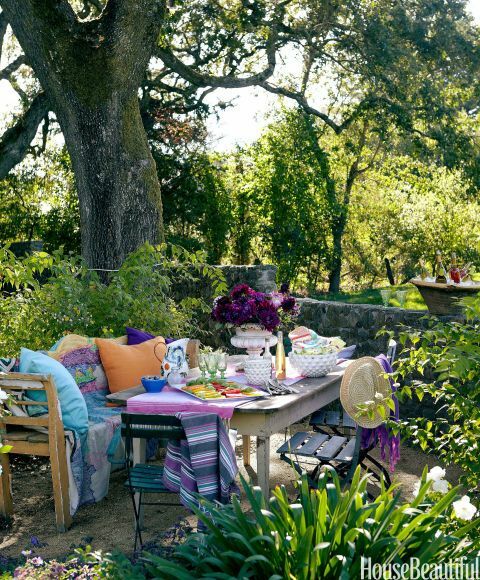 5>> Dress the outdoor table as you would inside. Again, it's all in the details! Napkins, real cutlery (please) pretty glasses and flowers all help create the ambience. You're guests will appreciate it and so will you! 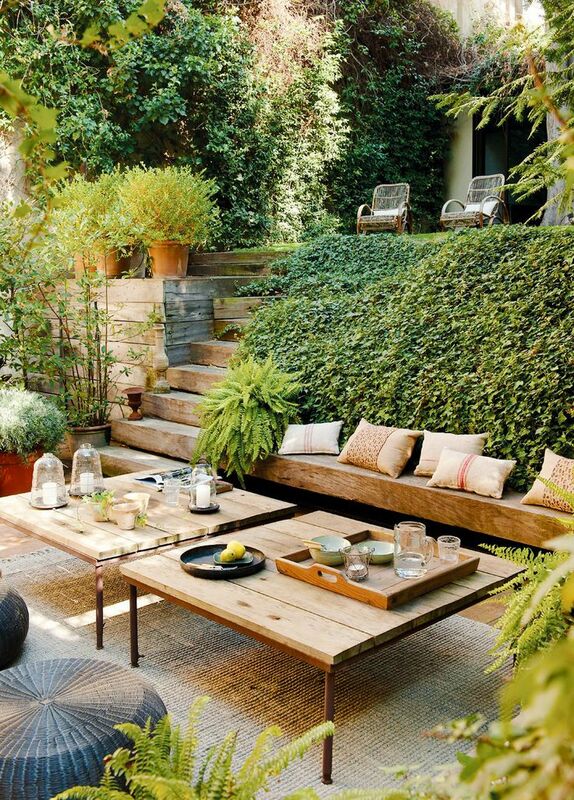 6>> Surround yourself with some plants and trees! It will create privacy (from your neighbours) and will help make the space cosier. Can't wait to start decorating! Are you going to try something new this year? And on another note, how do you like the new blog design?